To shed us of our winter blues we introduce Kate, Our first AP Vip of 2019. 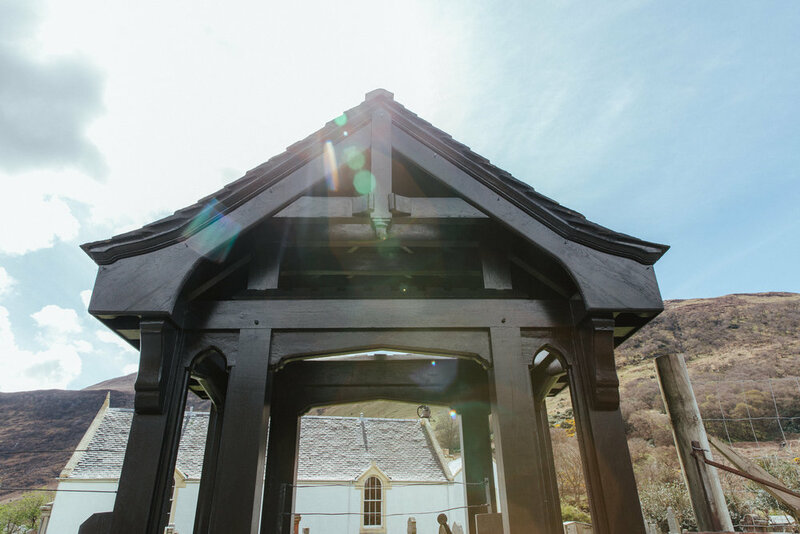 With her stunning intimate wedding on the isle of Arran, we are given serious Spring time inspiration. 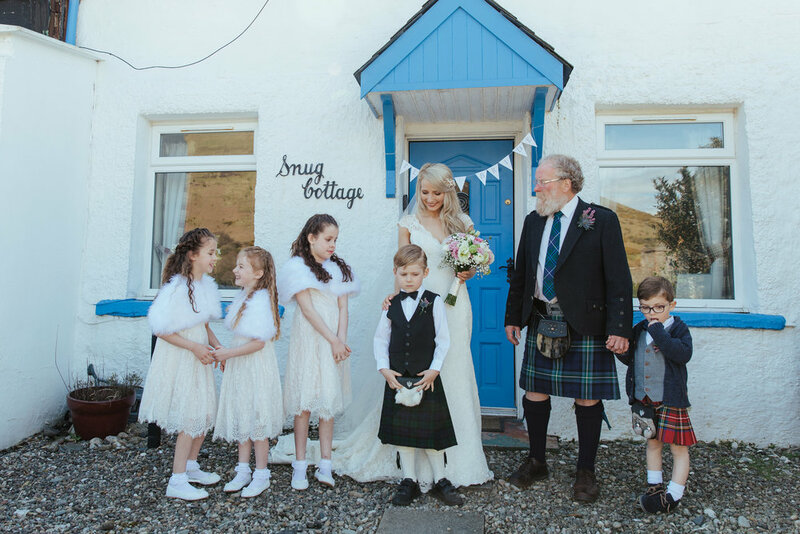 Follow Kate and Toms love story as they share how they planned their perfect wedding with blushing blooms, family tartan, and to complete the look, Kate’s vintage inspired gown. 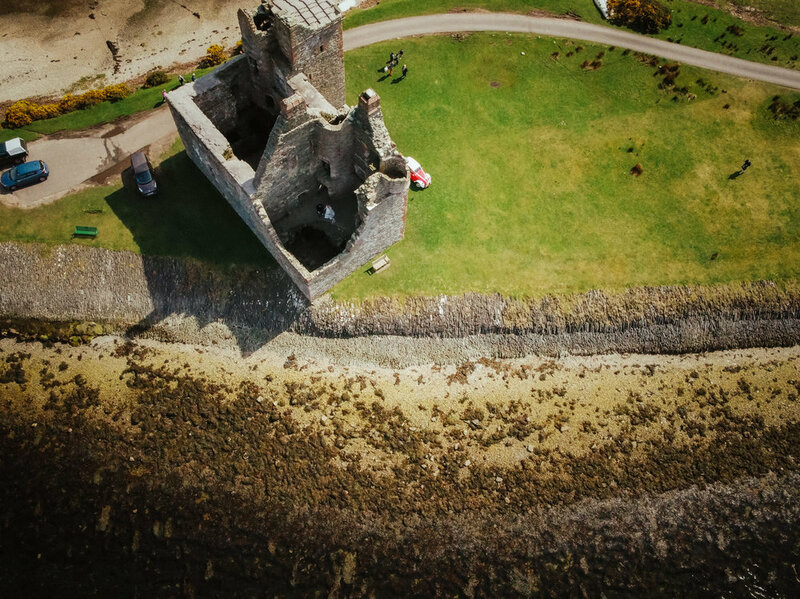 Yes it was, we were over on the Isle of Arran (where I'm from) and Tom got down on one knee on a walk on the beach at Lochranza Castle on a sunny Autumn day. 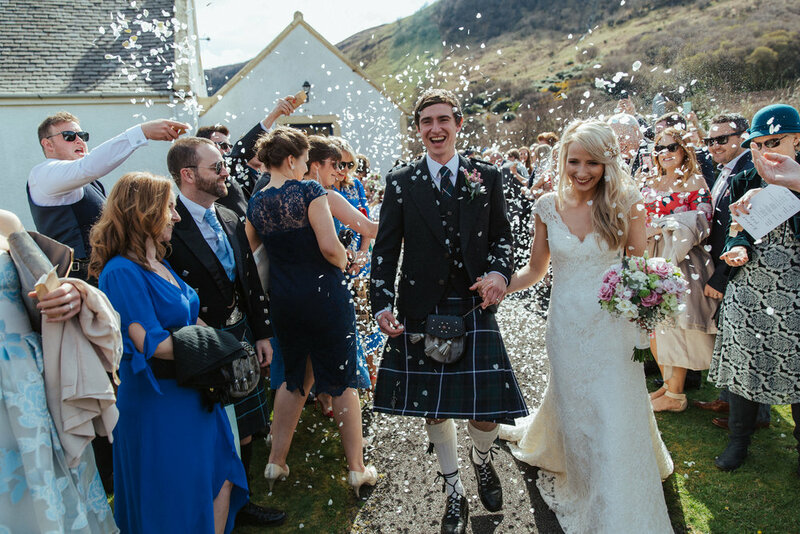 We both went to the same university so we knew of each other, but we met properly after university on a night out in Glasgow through mutual friends - one of Tom's friends is married to one of my friends. TELL US HOW YOU/ THEY CHOSE YOUR RING? Tom is laid-back, positive and always makes me laugh. 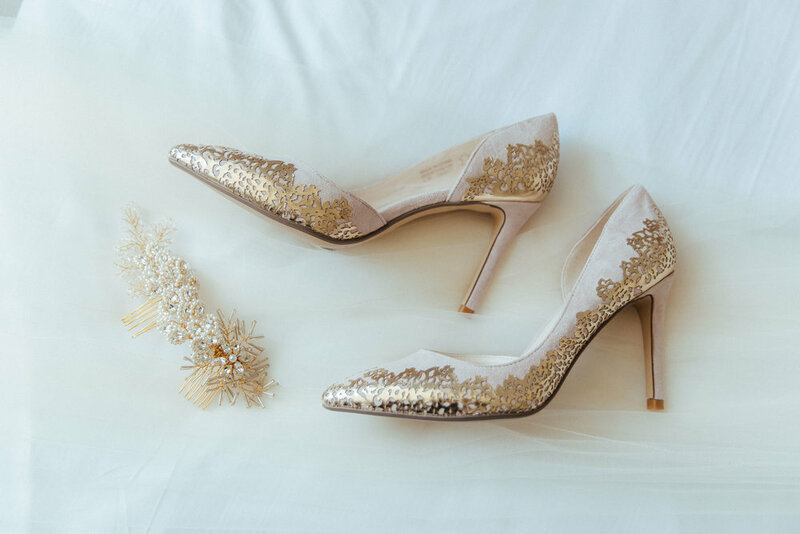 DESCRIBE YOUR WEDDING STYLE IN 3 WORDS? We went for a laid-back, rustic, springtime theme. WHEN YOU SAID YES WHAT DID YOU PLAN FIRST? The location! 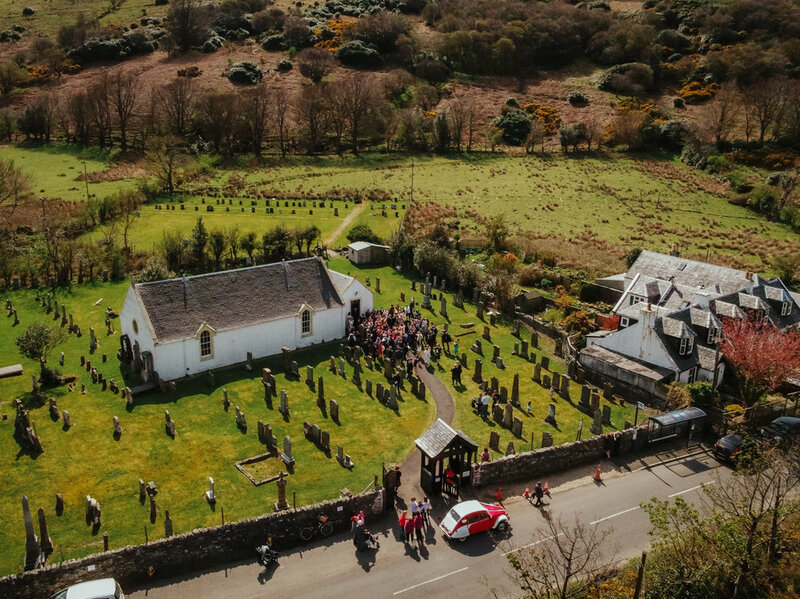 I always knew that I wanted to get married in Lochranza on the Isle of Arran where I grew up. Was THERE ANYTHING THAT TOOK YOU BUY SURPRISE WHEN PLANNING THE BIG DAY? 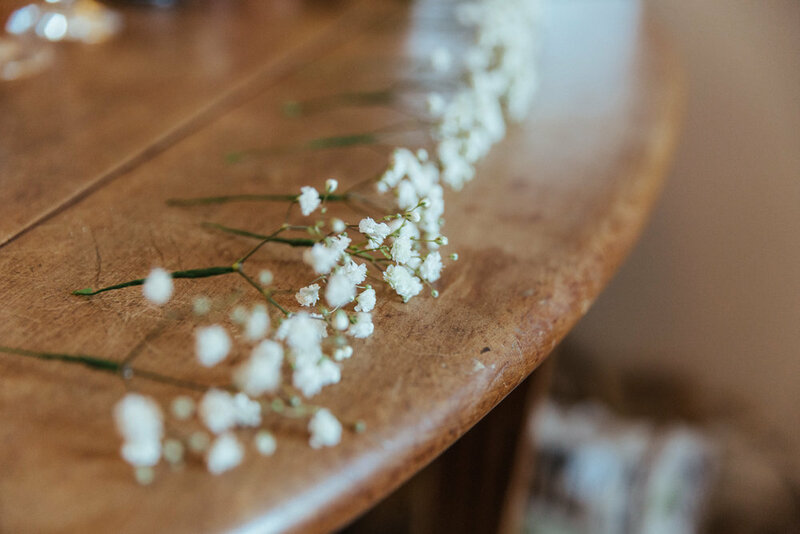 There are so many small details that you take for granted as a guest at weddings, I had no idea how many things you need to think about when planning a wedding! WHICH DRESS DID YOU CHOOSE? HOW MANY DRESSES DID YOU TRY ON BEFORE FINDING "THE ONE"? HOW DID YOU KNOW WHEN YOU HAD FOUND THE DRESS? I knew as soon as I put on my dress that it was "the one" which is surprising for me as I'm usually very indecisive! It felt really special but I still felt like myself. WAS YOUR PARTNER SURPRISED WITH YOUR DRESS CHOICE? Not really, mainly because he doesn't have a clue about wedding dresses!! WHO DID YOU TAKE SHOPPING, AND WHO HAD THE BIGGEST INFLUENCE? My two sisters (who were bridesmaids) and my friend Gen. They were all great and quite honest haha! They could tell immediately when I found my dress and thankfully they all loved it too! WHO WAS YOUR STYLIST AND HOW DID THEY HELP YOU? She was lovely but I can't remember her name. She was also really helpful at suggesting things and helping me say no when it was clear I didn't like something. HOW DID YOU STYLE YOUR BRIDESMAIDS, HOW DID THEY COMPLEMENT YOUR DRESS? 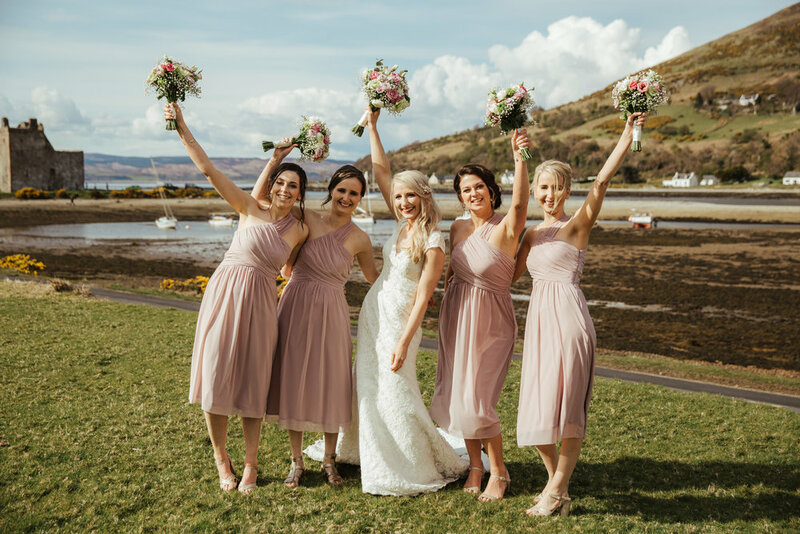 The bridesmaids wore dusky pink floaty dresses with gold shoes, and gold jewellery with a cosy cream wrap to keep out the cold! 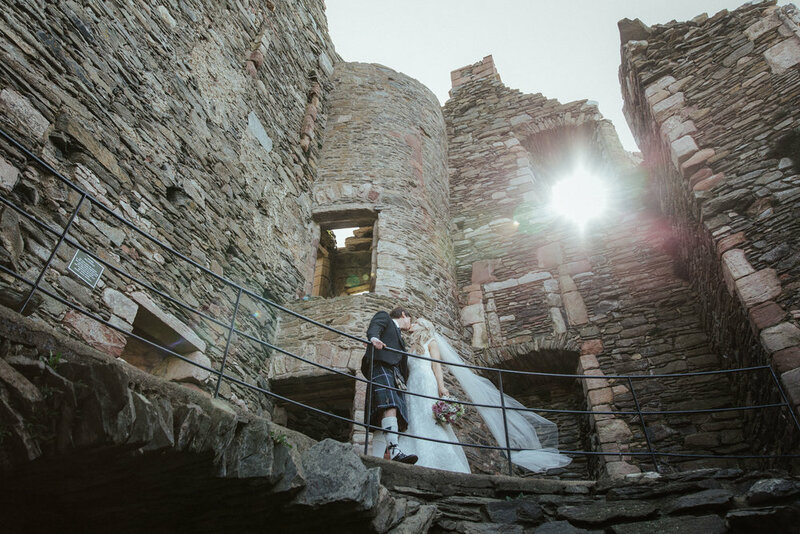 WHAT WAS YOUR FAVOURITE MOMENT IN YOUR WEDDING DAY? The whole day was so lovely, it's hard to choose one moment. I loved getting ready in the morning with the girls and also I really enjoyed the drinks in the sun with all the guests before dinner. But walking down the aisle and seeing Tom along with all our families and friends was probably the most special moment. 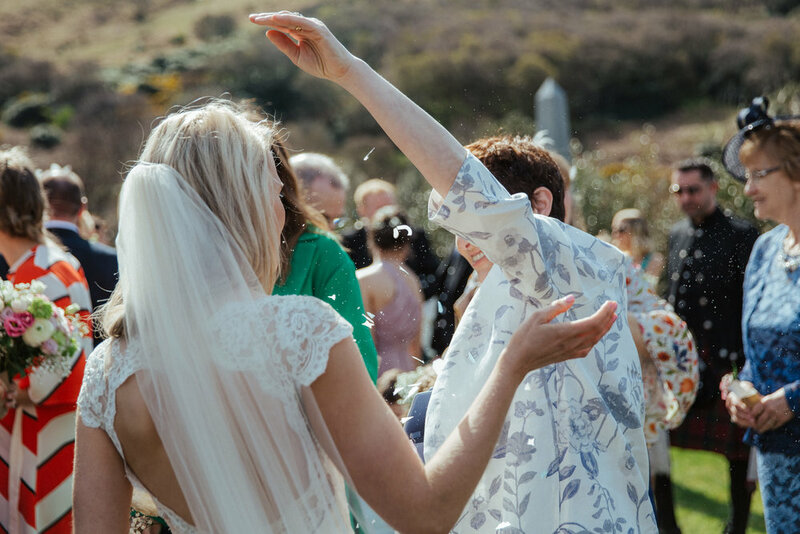 WHAT WAS YOUR FIRST DANCE AS MR & MRS? 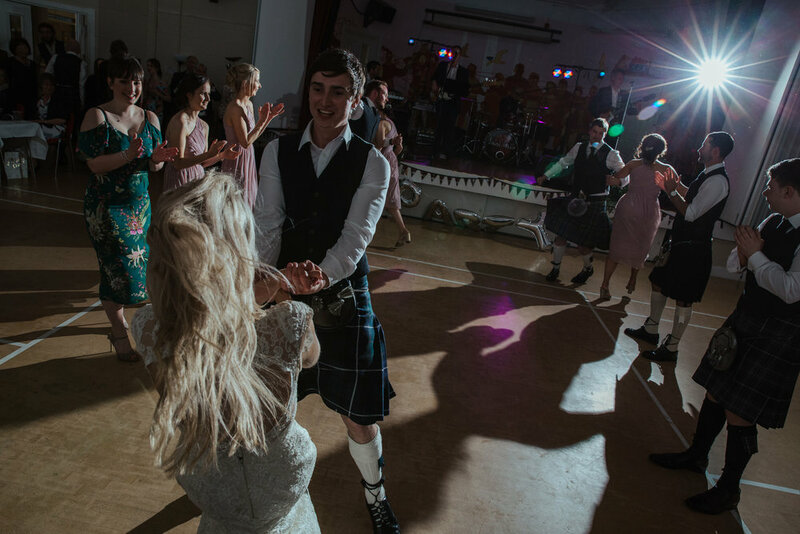 We broke tradition and had a strip the willow ceilidh dance with the bridal party as our first dance! WHAT ADVICE WOULD YOU GIVE TO OTHER BRIDES-TO-BE? 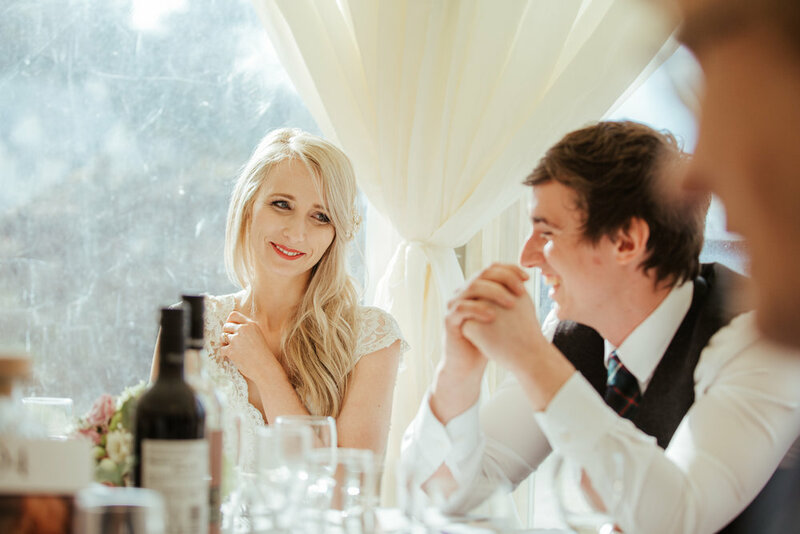 Try to be as organised as possible in advance so you can sit back and enjoy the big day when it comes. WHAT IS THE BEST PART OF BECOMING A MRS? To be honest nothing has really changed! WHATS THE BEST RELATIONSHIP ADVICE YOU HAVE EVER RECEIVED? 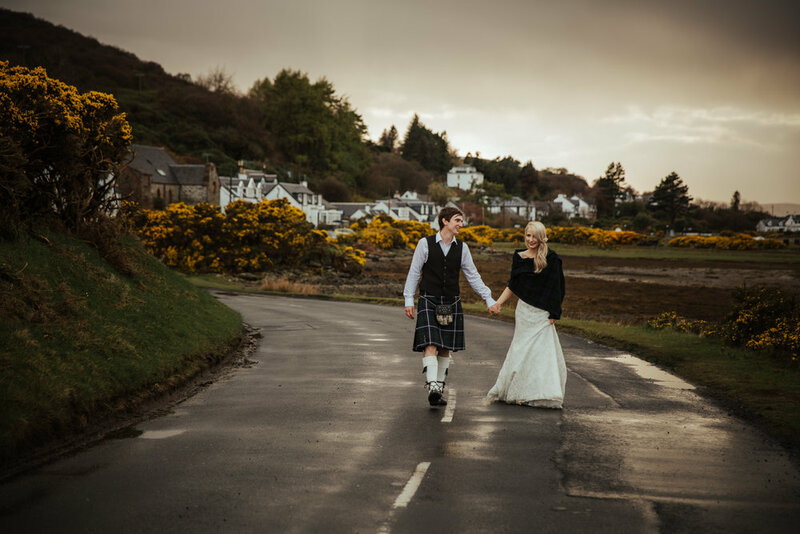 The groom wore - his traditional kilt outfit (MacRae Hunting Modern tartan) and matching tartan tie with a dark grey tweed jacket.